Not of it. : What's with all the Blogging? What's with all the Blogging? It seems like blogging has become as regular as a new Harlem Shake video. Okay, that was an exaggeration. But the question remains, "What's with this boom in blogging? ", especially among everyone at Sojourn? "The City is clogged with blogs!" It may seem like information overload, but it must be counted as an encouragement that there are brothers and sisters who continually desire to shape their minds in the understanding of Christ and God's word, share their struggles, share their backgrounds, and desire to encourage one another in our family of faith; even if it is digitally. Here are some thoughts about all this blogging, especially for those within Sojourn Houston (or who have other brothers and sisters in Christ who are blogging), and who are subjected to seeing our links and posts through the context of The City, Twitter or Facebook. First and foremost, blogging is NOT a replacement for worship, community, real conversations with others, and the reading of God's word. The most important aspect here is worship. Without worship, community, conversation, and the reading of God's word are just tasks for us to complete, devoid of any sort of lasting joy. Podcasts of our favorite pastors help in our growth, but can't be relied upon either. Nothing can replace the worship, teaching and fellowship that takes place within the context of a local church. Blogging also is not intended to be boastful. For those of us that blog, it must be recognized that we are not professionals, are not celebrity pastors, and that we have a limited knowledge of God. Rather, we are those who are on mission, plodding along in the context of a local church, continuing to increase our knowledge and understanding of the Lord, growing in His holiness; and are also sinners in need of encouragement and guidance from our brothers and sisters in Christ. Blogging can assist in sharing experiences with others, including family and friends, and as an outlet to be able to process ideas, thoughts and reflections. Blogging is exercise for the brain. For those that experienced collegiate writing courses, our brains were challenged, and, whether you know it or not, developed more advanced writing skills. So, now that we are working in fields that do not demand regular writing, blogging can be an exercise in creativity and the thought process, and a way to increase our knowledge and understanding of God's word. While we (those of us at Sojourn Houston) see each other in the context of community through Sunday worship gatherings and weekly neighborhood parish gatherings, we don't always get to share our thoughts in their entirety or elaborate as much as we would like to due to brevity. Sharing thoughts through a blog can fill those conversational gaps. Blogging can be a means of leadership. 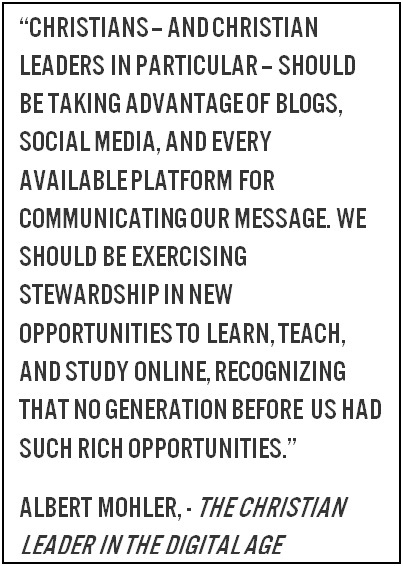 (Read here what Al Mohler has said about Christian leaders in the digital age). Leaders are commonly held to a higher standard, and must be accountable and willing to defend their actions and thoughts. Even though many of us are young in the grand scheme of our time spent in communion with the Lord, I believe as a body, we have a variety of experiences and perspectives that are worth sharing and can provide encouragement to others. Finally, scripture calls us as brothers and sisters in Christ to exhort one another daily so that our hearts would not be hardened to our sin (Hebrews 3:13). We are also called as co-laborers in Christ to hold fast to our confession of Christ as our savior, stirring up one another to love and good works (Hebrews 10:23-25). Actually, the entire book of Hebrews is considered to be a word of exhortation (Hebrews 13:22). While you may not have had your life changed through a blog post, we can be sure to point to numerous posts that have been informative, refining, and encouraging, and most of all, timely to struggles or issues we have faced. They have helped to reorient my attitude or behavior on days where my heart is vulnerable to hardening in sin. That is the mindset I have adopted while typing my thoughts into blog form, and I am hopeful that our contributions stir up good works to the encouragement of our brothers and sisters in Christ.